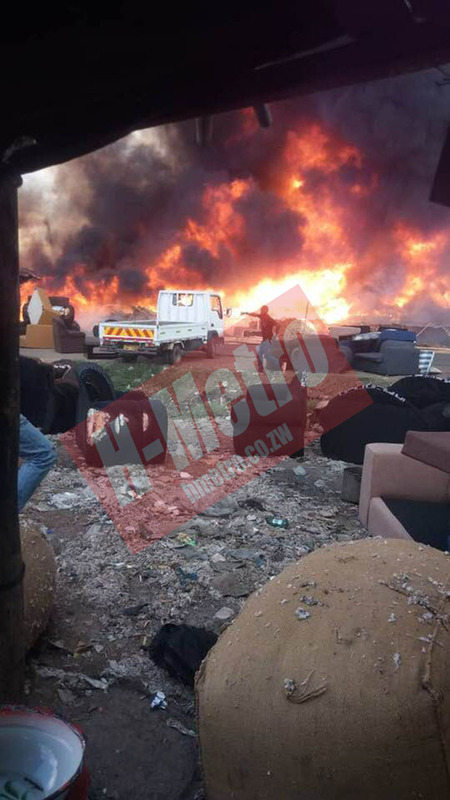 Another fire broke out yesterday and destroyed property worth thousands of dollars at Glen View Area 8 Home Industry Complex. The inferno arguably the most high-rising so far and the third this year was believed to have started from a cigarette smoke in one of the stakeholders’ workshop. Stakeholders failed to contain the fire before it could spread out quickly to neighbouring furniture malls while some chemicals nearby caught fire leading to fast spread of the fire. When H-Metro visited the scene, the fire brigade had managed to stop the fire from spreading to a nearby service station. 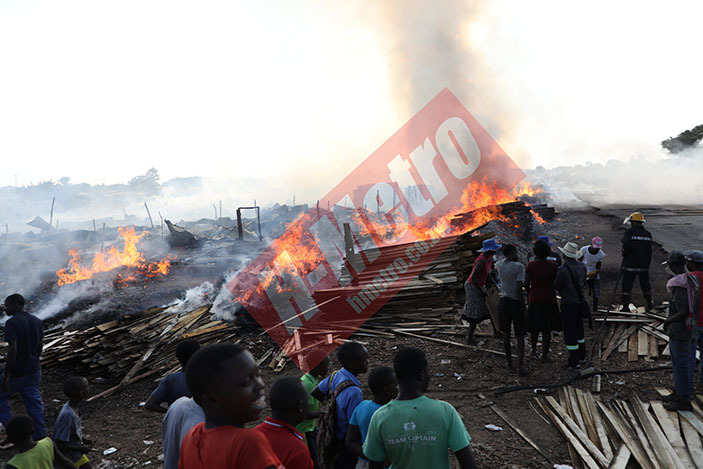 One of the stakeholders, Peter Majome, who spoke to H-Metro revealed that the fire started from his stall. “Everything happened so fast, about three guys came into my work area whilst they were smoking something that smelled like dagga. “As they smoked and spoke to me one of the guys dropped a stub on the saw dust and immediately a fire started. “We all tried to stop it but some of the chemicals quickly caught fire causing an explosion,” he said. Majome regrets losing his savings due to the negligence displayed by his colleagues. “I have lost a pair of sofas that were in two of my workshops. I was expecting to be paid $5 200. The planks and other furniture I was designing were also burnt to ashes. Another couple Washington Mugabe and his wife, who have been operating at the complex since 2003, were short of words. “I was operating next door to Majome and the fire was just too big after breaking out. “We were all surprised by how fast it was spreading, the fire destroyed all my stuff worth thousands of dollars I had invested in this project; we couldn’t do anything to save our furniture. “This is the third time my wife and I have been affected here at the complex,” he said. Mugabe also dismissed rumours that the fire was caused by juju. “I don’t have much to say now because I am hurting, all those who think the fires are a result of juju must be mistaken, it is pure human error all the time. “We are again appealing to the authorities to build us proper structures so that we rent and cease to hear all these fire stories,” he said. “We received the first fire report at around 3pm and we attended the scene. “We managed to ease off the fire so that it would not spread to the service station which was our first port of call. “Our only challenge was that the water which flows next to the complex, our tanks failed to draw water from it because it was oily and contaminated. “We were forced to get our feed from Highglen which was a distance away,” he said.